Gerry Harris in his Molineux prime. Wolves didn’t quite call Gerry Harris in from the green fields of Shropshire to play 300 games for them, win a couple of League Championships and an FA Cup and then send him back to work the land. But that synopsis isn’t too far from the truth. “My dad was a farm worker and so were my three brothers,” says the former full-back from his ‘patch’ just outside Bridgnorth. “My son lives next door to me now and my aim was always to own some green pasture. I have three acres of lovely grass these days right next to the house, so I’m very contented. From such rural roots, Harris, now 75, came to serve the club he supported as a boy ten miles away. “My dad couldn’t afford to take me to games and I never went to Molineux until I went for a trial,” he added. “I’ve had a dream life because a chap came to Claverley School when I was 15 and asked us what we wanted to do when we left. Most said they wanted to go into farming but I said I wanted to play for the Wolves. “I was playing for Claverley and also for Bobbington and someone put a word in with a Wolves scout he knew. “Dad went up on the bus with me and I ran around the pitch for an hour on my first night. I never even saw a ball. “But they found me a game in their Wolverhampton Amateur League team on the Saturday. It was in the first division and I had previously been playing in the ninth division but I must have done okay because I was soon in the third team and the reserves. “Even so, one of the coaches at the club was giving me some poor reports and my chances were probably in the balance. 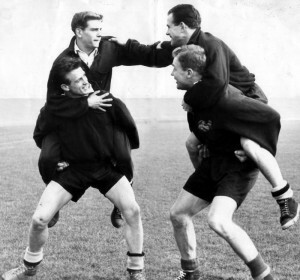 “The third team’s last game of the season was at Banbury, so Stan Cullis sent Billy Wright and Bill Shorthouse to run an eye over us and see which ones might have a future at Molineux. “Apparently they went back and told him I should be in the first team. I have always been so grateful to them for that, especially to Bill Shorthouse as he was recommending someone for his position. 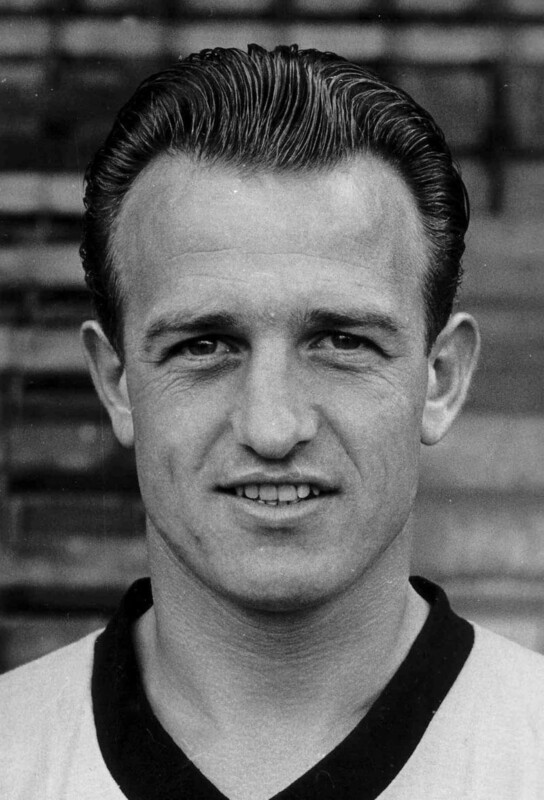 Harris, who had earlier attracted interest from Albion, was blooded in Wolves’ first team in a friendly defeat at Notts County the day after he had been taken to watch a 3-3 draw at Sheffield United on the final day of the 1955-56 season. Harris (left) and Malcolm Finlayson find themselves as the 'mules' in this horse-play also involving Bobby Mason and Norman Deeley. His League debut came a few months later in a 5-4 home win over Luton and, with Shorthouse suffering injury problems, he went on to play a further 32 games in his breakthrough campaign. Over the next three trophy-laden years, he missed only 13 League and Cup matches, figuring in the club’s first entry into official European competition and many of their floodlit games. He won four England under-23 caps and later played for Walsall, Telford and Bridgnorth, the last of whom he served as player-manager for several years. NB Our apologies for the lack of a current picture with this article. Gerry has expressed a certain reluctance to have his photo taken but we are working on it! Posted on: Tuesday, January 11th, 2011.